Trace Kinnel breaks through the line for a big gain. Fairmont quarterback Braden Miller scrambles away from Wayne defensive pressure as fullback David Rucker lends blocking assistance. Fairmont quarterback Braden Miller scrambles away from Wayne defensive pressure as fullback David Rucker lends blocking assistance. Senior running back Justin Williams cuts back to pick up a gain at Fairmont. Rashad McKee stiff arms Fairmont defensive back Kaleb Hall. 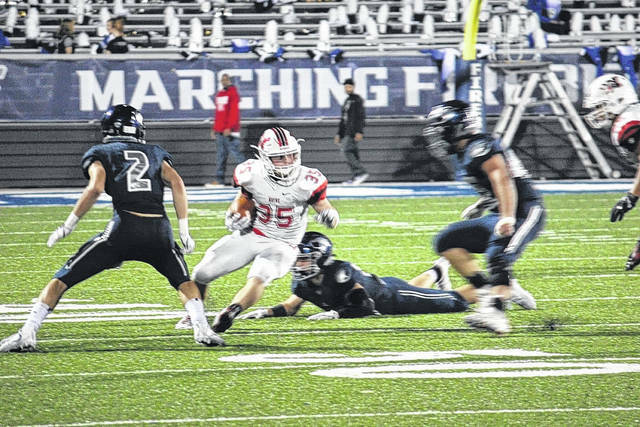 KETTERING — The Wayne Warriors had quite a Friday the 13th scare but was able to pull out a thrilling victory 35-28 over the Fairmont Firebirds in Kettering. Fairmont stayed with Wayne the whole game and had its opportunities late in the game. Wayne came into the game wanting to get out to a two or three score lead since Fairmont is not built to come back. Wayne looked like it would do just that when it took its first drive the game straight down the field and capped it off with a Rashad McKee QB sneak from 2-yards out for a 7-0 lead. 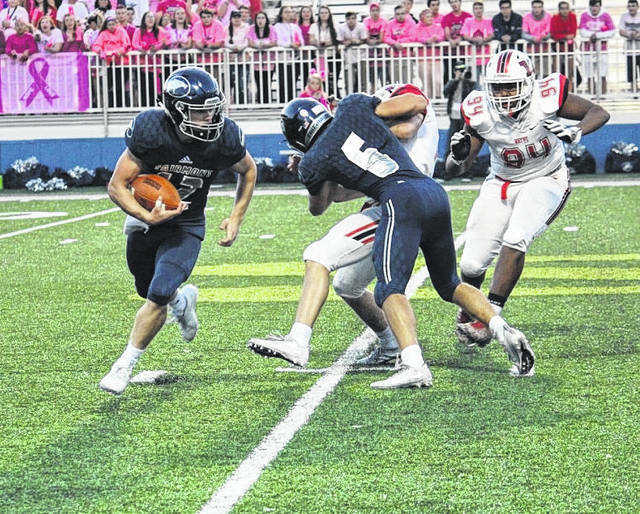 Wayne stopped Fairmont on the next drive and started a drive of its own. An interception by Fairmont junior DB Ryan Hall ended the drive and set Fairmont up in the good shape. The Firebirds made the turnover count by capping off the drive with a 21-yard run by senior running back Jake Perkins to tie the game at 7. Wayne’s next drive stalled and Fairmont drove the ball right back down into Warrior territory. A 10-yard run by junior Jesse Deglow put the Firebirds up 14-7. Wayne answered with 14 unanswered points on a 10-yard Rashad McKee touchdown run and a 4-yard McKee to Steven Victoria touchdown pass. Wayne led 21-14 at the half. Wayne received the ball first in the second half, but could not execute well enough to get a first down. Fairmont took advantage the opportunity and tied the game up 21-21, on a 27-yard Jesse Deglow touchdown run. Wayne and Fairmont traded touchdowns to bring the score even at 28-28. Wayne almost turned the ball over on the kickoff following Fairmont’s tying touchdown but was able to fall on the ball. The Warriors started their drive from their 25-yard line. Wayne used a combination of runs and passes to drive inside the Fairmont 20, but fumbled the ball away with a little over 2 minutes. Wayne stopped Fairmont and used its timeouts in the process to leave itself a little over a minute left in the game. 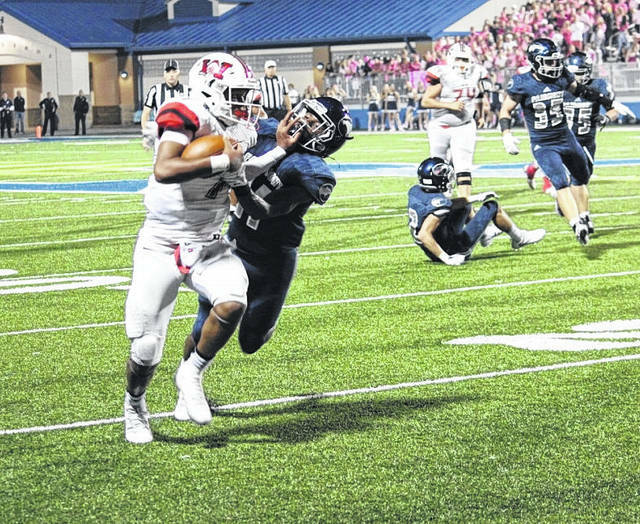 The Warriors moved the ball into Firebird territory at the 39-yard line and Rashad McKee spiked the ball to stop the clock at about 20 seconds left in the game. The ensuing play, McKee dropped back and moved the safeties to the long side of the field, then lofted the ball into the left end of the end zone towards L’Christian Smith. The ball landed in the hands of Fairmont defensive back Ryan Hall, but when he hit the ball it was jarred loose. L’Christain Smith snatched the ball and took possession as he rolled over. The ball never touched the ground so it was ruled a touchdown and Wayne was now leading 35-28 with 17 seconds left in the game. Fairmont tried some razzle-dazzle on the kickoff return and on the one play it was able to get off before time expired, but it was all for naught. Wayne pulled out the thriller 35-28. Rashad McKee was responsible in some way for all 5 touchdowns. He had three rushing touchdowns and two passing touchdowns. McKee had 280 yards passing and 67 on the ground. L’Christain Smith led all Wayne receivers with 13 receptions for 135 yards. Trace Kennel had a lot of success on the ground. He had to leave the game because of injury at the half and did not come back, but had 94 yards on 13 carries in the first half. 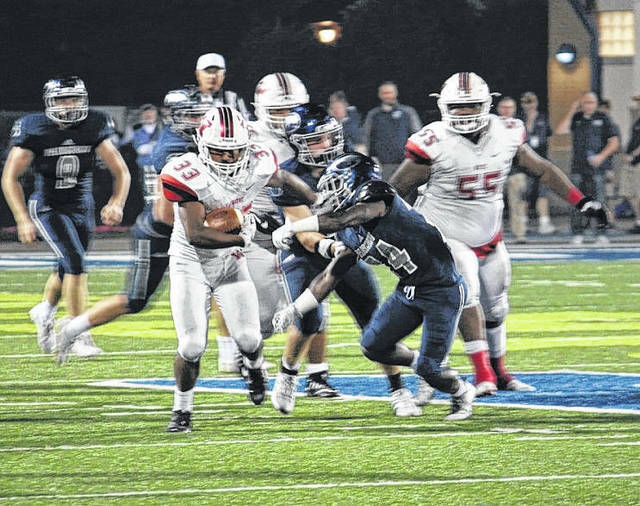 Fairmont’s running game was able to roll up 256-yards rushing on the Wayne defense and look unstoppable at times. Junior quarterback Braden Miller completed both passes he attempted for 72-yards passing. Wayne won’t have long to celebrate its win because it welcomes the Springfield Wildcats into Good Samaritan Field Heidkamp Stadium for another conference game next Friday. Fairmont travels to Centerville to take on the Centerville Elks.